The NARVAL series of airborne research flights using the German research aircraft HALO have had two phases: NARVAL 1 which flew in December 2013 and NARVAL 2 which flew in August 2016. The goal of NARVAL was to supplement long-term measurements at the Barbados Cloud Observatory with the aim of better understanding the role of shallow clouds in mediating the Earth’s radiative response to warming, so-called cloud feedbacks. 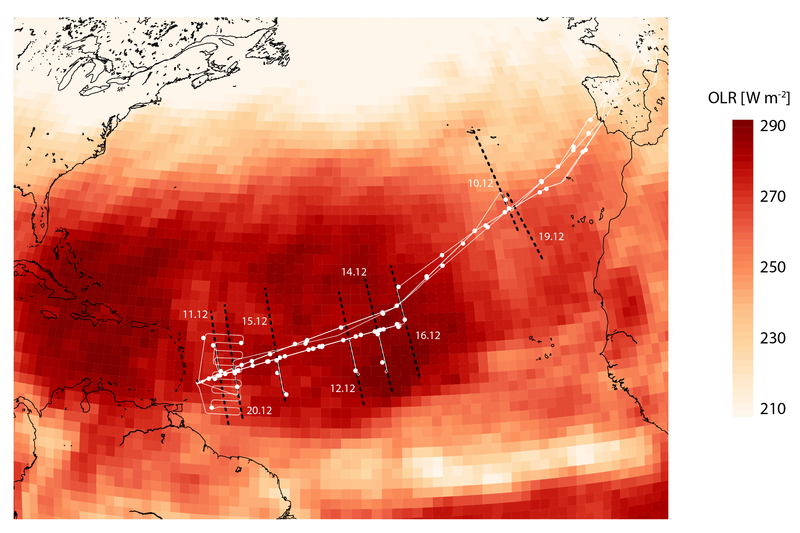 NARVAL2 also began to explore the link between clouds and circulation in preparation for EUREC4A, and factors influencing deep convection within the Atlantic ITCZ. 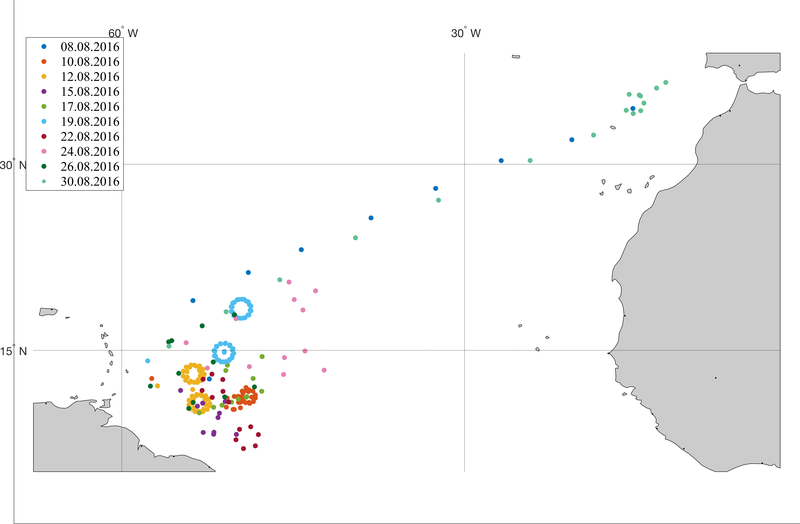 To date eighteen research flights over the tropical Atlantic have performed, and the data is made available to the community subject to the access restrictions and policies below. 1. No redistribution: Groups who are using the data are asked not to redistribute this data, but rather refer those interested in accessing the data to the original source, and these guidelines for the data use. 2. Coordinated Use and Acknowledgement: Unlike in some other contexts the NARVAL data is made available through the individual efforts and particular funding of a number of independent research groups. Often the data that is collected represents the fruits of many years of effort to develop, certify and operate an instrument. This effort is often connected to individual research projects, and even PhD projects. For this reason we consider it a matter of scientific integrity for users to respect the priority of those who collected the data, by coordinating your planned use with the instrument PIs (listed below), and making an effort to explicitly and clearly acknowledge the origin of the data when it is presented to a broader community in the form of publications or presentations. 3. For publications that include NARVAL 1 and/or NARVAL 2 data, include the following in your acknowledgements: The data used in this publication was gathered in the NARVAL 1/NARVAL 2 (Next-generation Aircraft Remote-Sensing for Validation Studies) campaign and is made available through [insert name of the institute]. NARVAL was funded with support of the Max Planck Society, the German Research Foundation (DFG), the European Research Council (ERC), the German Meteorological Weather Service (DWD) and the German Aerospace Center (DLR). NARVAL is funded with support of the the Max Planck Society, the German Research Foundation, the European Research Council through an Advanced Grant, the German Meteorological Service (DWD) and the German Aerospace Center (DLR).